The reason that so many SaaS companies struggle to accurately calculate core metrics like MRR and Churn has nothing to do with their complexity. The formulas are pretty straightforward and accessible, even if you slept through most of your math classes like I did. In our work building our free SaaS analytics tool ProfitWell Metrics, we've found that convoluted billing software deserves most of the blame for our collective metrics illiteracy. SaaS companies have a strange affinity for overly complicated billing system configurations — to say nothing of those that decide to frankenstein a billing system of their own — that makes extracting all of the necessary data for metrics a nightmare. To improve your life (and your understanding of your business), you should be designing your billing system in a way that leverages the strengths of existing systems. Yet with so many options out there, it can be tricky to find the perfect fit. 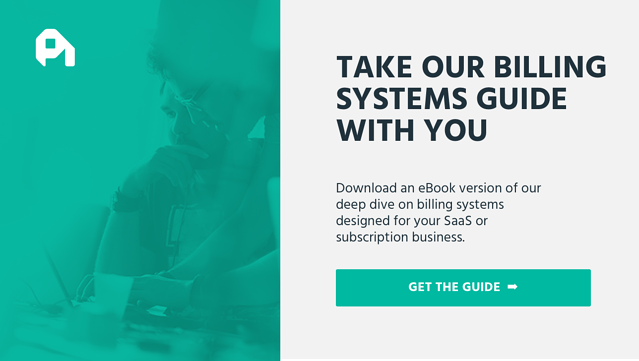 To prepare you for your journey to your billing system Shangri-La, we've put together a complete explanation of the types of billing systems on the market and detailed dossiers on 21 different providers. If there's a particular system you already know you want to check out, you can jump to it with the links above. Before we get into our comparisons, we first need to talk about the types of systems available. With so many different options that seem to address overlapping parts of the billing process, it's important to figure out exactly what your company needs. Starting from the payment gateways, the most customer-facing of the bunch, and moving towards internal services, these are the components of a complete billing system. Payment Gateways connect with credit card companies and make it easy for you to accept online payments, and your customer to use any card —without the cumbersome prerequisite of submitting to Payment Card Industry (PCI) compliance. Merchant Accounts are bank accounts that allow your business to accept money from payment cards. Some are provided behind the scenes, so you may not know about them. Subscription Management (also called Recurring Billing) services work on top of payment gateways to handle subscriptions and make sure the right accounts are charged the right amount every month. Analytics systems give you an in-depth look at your customers and sales. These tools give you the insights you need to optimize everything from pricing to retention. 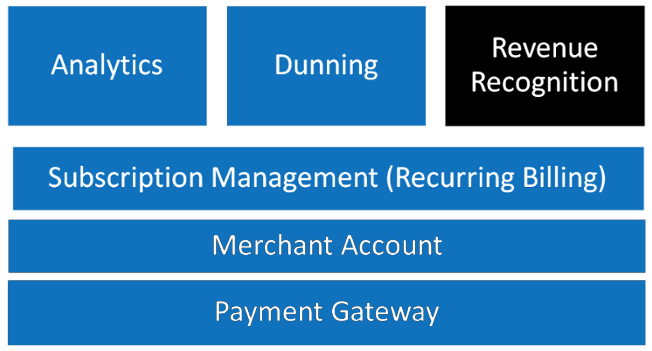 Dunning tools work to mitigate the impact of failed payments by ensuring customers always have updated credit cards on file. Some systems proactively ask a customer to update a card that will expire soon; others follow up after a charge bounces. Revenue Recognition systems automate legally mandated accounting processes and ensure that you're only booking revenue for products or services you've delivered. In the past, most SaaS businesses would simply choose one of each service and combine them to create a billing stack. As more services have entered the market and capabilities of existing systems have increased, the lines between these systems have blurred. There are now “hybrid” billing systems that include both a payment gateway and a subscription layer. That's not the only evolution in the billing world. Systems previously restricted to sales and finance are now in use by marketing (campaigns segmented by billing type), operations (data-driven iteration on billing frequency), and customer success (generating expansion revenue and reducing active and involuntary churn). Your choice of billing system can impact the success of your entire team. The companies behind these systems have stepped into these bigger shoes with varying degrees of success, responding to customer demand by introducing new functional integrations, role management capabilities, and tools for development and operations folks. What size is your company? Companies at later stages will need more sophisticated options and customizability than early stage companies. What is the size are your customers? Are they willing to pay higher prices for more custom plans? If your customers are enterprise level or you find yourself selling a lot of custom plans, you'll need a stack that can accomodate. What's your approach your pricing? Do you want to offer specific features like discounts or upgrades in addition to your plans? Flexible pricing means you'll need a stack that is equally customizable. We'll answer these questions when we do a deep dive into each system to help give you a clearer picture of which services best fit for your company. 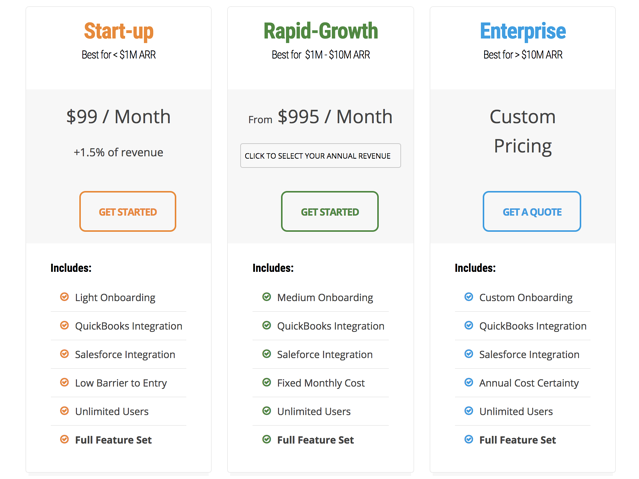 These systems are designed for SaaS companies in the growth stage. They're perfect for new and scaling startups and and pack enough flexibility and features to grow with you. The chart below gives you an overview of all the billing systems in this category. If you're still a relatively small company and your billing isn't too complex (and probably won't become more complex in the future), we recommend Stripe and Braintree. Let's jump in to see how they stack up against their competitors. We'll start with hybrids -- payment gateways that have a subscription layer. A favorite among fast growing SaaS companies, Stripe is known for being super easy to use and easy to integrate. Stripe is a system you can get up and running in just a few minutes. Their composable payment APIs let developers focus on the product rather than writing payments code while providing enough detailed support documentation to allow advanced options. What Are They Great At? Stripe's use of flexible integrations and built-in APIs makes it perfectly designed for programmers and developers at lean startups. Stripe's focus on removing all of the pain points in setting up a billing system simplifies the billing process and saves hundreds of hours of dev time. The strength of Stripe's “per card charge” is that it allows new businesses to start billing with minimal costs. But this charge quickly adds up once you scale and generate a higher volume of transactions. Stripe gets really expensive for companies that are too large for the "pay as you go" plan but too small for the enterprise plan. How Does This Fit In Your Billing System? 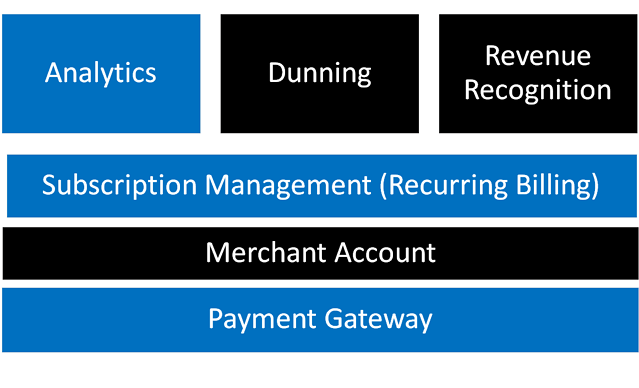 As a hybrid system, Stripe bundles a payment gateway, merchant account and subscription management platform into a single service. 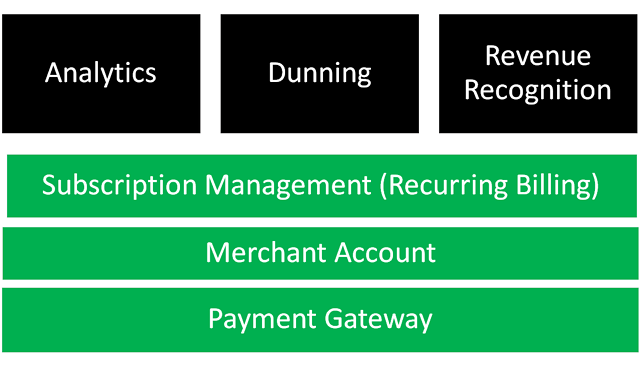 Stripe provides a solid foundation for billing, but needs to be integrated with a subscription management platform that has a wider range of subscription-specific features. Company Size: The ease-of-use makes this great for developers at any growing internet business. Customer Size: The pay-as-you-go plan means you can offer affordable plans to your customers, and as you scale up, your customers will grow with you. 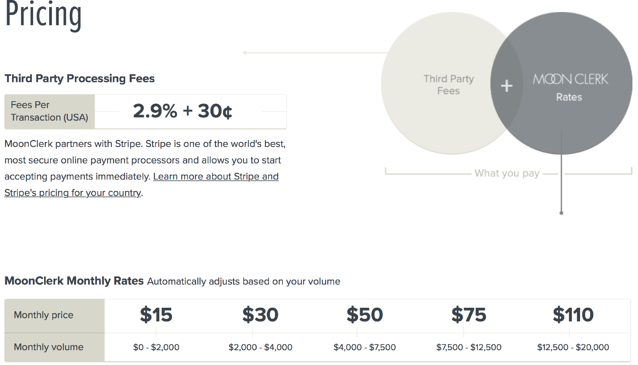 Pricing Approach: Stripe fees are transactional, allowing you to have more flexible pricing to bring in customers as you grow. 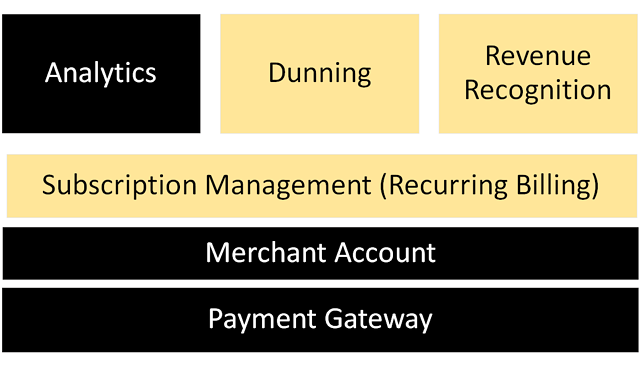 Subscription billing systems often require an integration with a separate payment management system that comes with complicated hidden fees. Braintree works to provide a simple and transparent payment management system that allows the use of any gateway without having to worry about regular subscription fees. They consolidate multiple payment options under one roof that would otherwise be time consuming to access on your own. Braintree is built to work across all platforms, including mobile apps and websites. Because of its full coverage of payment options, it's a great choice for a wide range of users from freelancers through larger companies looking to expand on multiple platforms. Braintree also comes with no minimums or monthly fees, as you only pay them for the transactions you process as a full-stack merchant. They also have robust international availability and currency settlement options. Similar to Stripe, Braintree charges on a per transaction basis. With medium to high transaction volume, it can get expensive pretty quickly if you aren't big enough to qualify for their discounted rates. Braintree is a hybrid service with a built-in payment gateway, merchant account and subscription management service. It can also integrate with your existing merchant account if needed. If you combine it with another subscription management system, it can still be used for its gateway function. Company Size: Braintree is great for companies big enough to start expanding to multiple platforms or internationally. Customer Size: The wide variety of payment options opens your business to most potential customers, from smaller customers who may prefer to pay over Apple Pay or Paypal to larger customers who prefer ACH. Pricing Approach: Your pricing can vary based on the size of your customer and the platform where they use your product. If your business runs on WordPress or you want to station your subscription service on your WordPress page, MemberMouse is a great option. It's a WordPress plugin designed to be an all-around platform to help you sell products, manage subscriptions, and curate memberships. It has a variety of built-in features to make the integration flexible and the system easy-to-use. Considering that WordPress currently powers 27% of the web, it's surprising that more billing systems aren't built for the platform. MemberMouse fills this gap and provides a secure system that allows users to start adding customers in just 2 minutes and 30 seconds. While MemberMouse offers a wide range of features to make your site and billing system customizable, the learning curve for new members can be significant. Making the product more user-friendly would allow non-developers to more easily customize it to their needs. 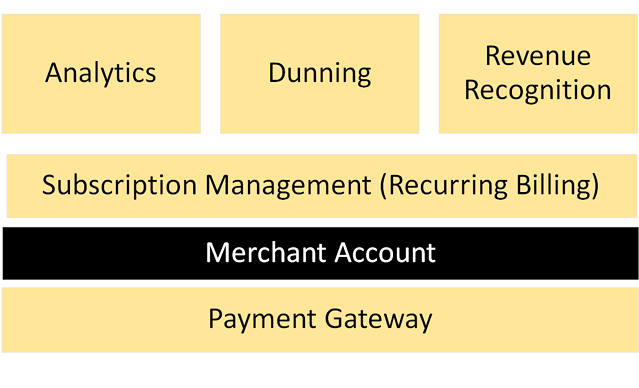 MemberMouse provides most of the structure needed to get your billing system up and running by providing a merchant account, subscription management system and features such as analytics and dunning. It also integrates with a number of different billing software solutions to provide a payment gateway. Company Size: MemberMouse scales well for Wordpress-based companies of all sizes, but operates best with businesses that already have a decent number of members because of its customizability. Customer Size: The customizability of plans allows you to cater to a wide range of customers. You can serve those who are interested in a one-time membership fee or those who prefer to pay in cycles. Pricing Approach: MemberMouse fees are fixed based on how many features you need, so you can pay for more features as the complexity of your pricing increases. FastSpring can help get a SaaS vendor site get up and running in a day. They are a full-stack service that goes beyond managing subscriptions and payments to offer storefront optimization, payment page customization, and back office services. 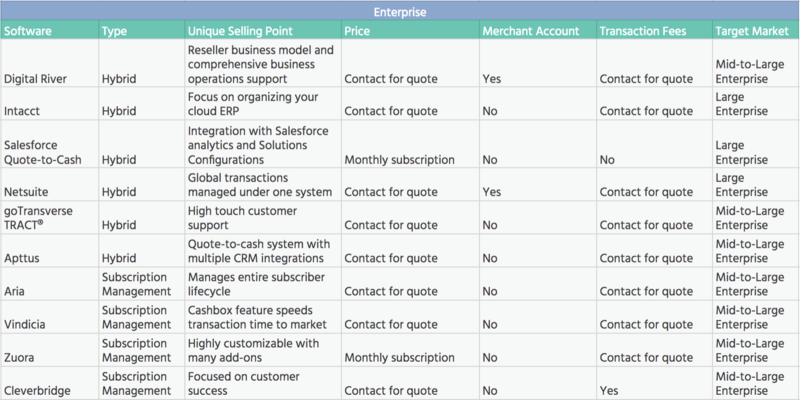 If you're looking for a one-stop shop for the business end of your SaaS company, FastSpring has you covered. FastSpring can help you build your payment process from scratch while maintaining a cohesive experience for your customers by integrating with your existing website design. It also automatically implements cosmetic pricing localization and automatically displays your prices to your customers in their local currency and language. They say you get what you pay for and with FastSpring, you're definitely paying for a premium service. At up to 8.9% per transaction, FastSpring is far from the most affordable option for a billing system. It can be difficult for the early-stage startups that FastSpring is equipped to help to justify the cost. FastSpring will take care of your subscription management and recurring billing. FastSpring also helps you prevent failed payments with built-in payment routing to maximize credit card charge success and provides analytics in their back end to track customers' payment activity. Company Size: FastSpring's ability to let you build a page from scratch makes it well suited to startups and small businesses. Customer Size: FastSpring offers a two main pricing options to accommodate teams with different types of customers. 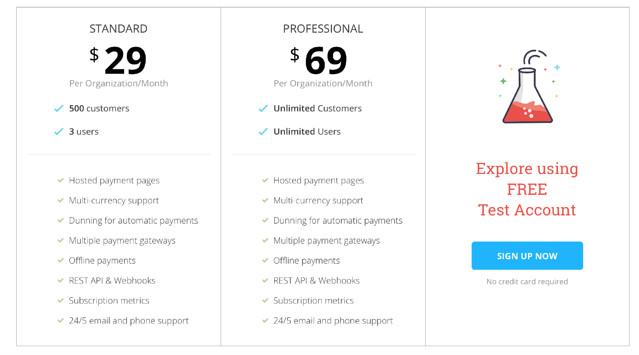 Pricing Approach: Customer support is at the foundation of FastSpring's service. They offer dedicated and prompt customer service to your team and your customers. This lets you have a hands-on, customer-driven approach to pricing. WooCommerce is incredibly flexible: it lets anyone set up an eCommerce site selling anything. Their toolkit of products can accommodate sales of everything from physical products to software. It's built to be used by store owners and developers alike -- store owners can easily create their own platform and developers can use WooCommerce's tools to help clients. WooCommerce is equipped to help teams at all stages. They can support your business whether it sells one product or thousands, so as you grow and expand your offerings, you don't have to worry about switching providers. They also support growth across platforms by offering integrations with third-party apps that let you turn a WooCommerce store into a mobile app. Their features are all built to integrate with WordPress, making them incredibly accessible. Although WooCommerce promotes its documentation as one of its strengths, users report that it's occasionally lacking. Without enough transparency in the code base, users have to purchase WooCommerce's ready-made extensions, which can get pricey. You can manage your billing through the site you create with Woocommerce. The product comes bundled with payment gateways: PayPal, BACS, and cash on delivery. You can also integrate with 366 extensions for additional features including analytics. Company Size: WooCommerce is open source software that is quick to deploy. If you're bootstrapped or don't have a lot of resources, WooCommerce is a great way to get started. However, once you require more than basic setup, you'll have to start paying for customizations, which can get costly. Customer Size: Given the many different types of payments accepted and the sheer number of extensions available, WooCommerce can be scaled to accommodate customers of many different sizes. 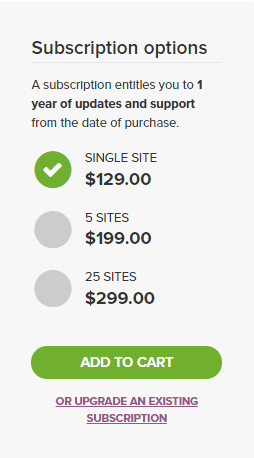 Pricing Approach: Use WooCommerce when you want to hit the ground running with your pricing. The initial setup is very easy and the WordPress plugin provides a deep community of support, so it's easy to deploy pricing quickly and simply. 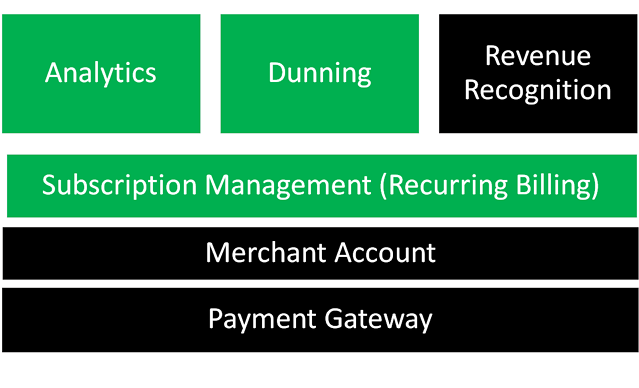 Next, we'll look at subscription management systems designed to support the subscription side of SaaS businesses in the growth stage. 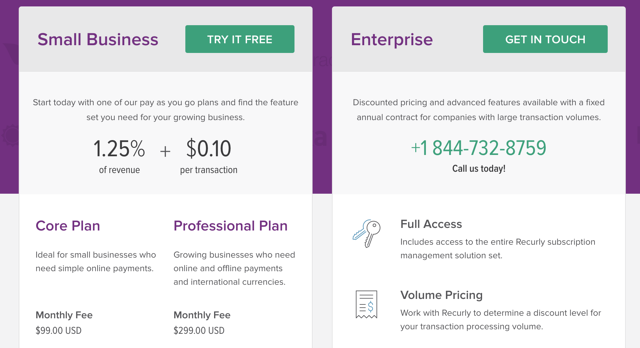 Recurly is an easy-to-use subscription management system that is great for SaaS businesses that are just getting started with a billing system. It's often used on top of payment gateway services -- even those that already have a subscription management system -- because its many options for quick integrations make payments easy. These built-in point of sale UI options help Recurly fit any company model. Even though Recurly lets you export your data to a CSV, its native reporting capabilities are limited. As it has both a fixed price and a variable fee, it can get expensive. Since you will probably need to layer it on top of another system, the price can be challenging for smaller-budget teams. Recurly is a subscription management system that includes analytics, dunning and revenue recognition features, but needs to be integrated with a payment gateway. They connect with a number of supported gateways to make setup easy. Company Size: Often used in tandem with something like Stripe, Recurly is great for companies that want to expand more into features like dunning and revenue recognition. Customer Size: Recurly's billing models allow for sales to a wide range of potential customers who can pay for everything from a one-time product as part of a subscription to a variable recurring charge based on usage or another value metric. Pricing Size: Each billing model allows for a different type of pricing, based on what features of your product you want to offer and what value metrics you use. This allows for flexibility, and lets you test out different types of pricing. Chargify is a subscription billing and management platform that’s focused on working with complex billing approaches for companies that regularly update their pricing. Chargify’s platform includes tools to manage the entire customer lifecycle, including customer service, retention, and reporting. Chargify uses revenue percentage model for pricing that gives you several tiers to choose from. Similar to Recurly, it’s used in concert with payment gateway services and offers a variety of integrations. While Chargify will let you use different currencies on different websites, they don’t support the use of multiple currencies within a single site meaning your analytics will be currency specific. This can make pricing localization trickier, but they aren’t the only system that does this. Chargify is a subscription management system with features from recurring billing to customer service options to reporting. They integrate with 20+ gateways to get you up and running quickly and will help you set up with a merchant account. 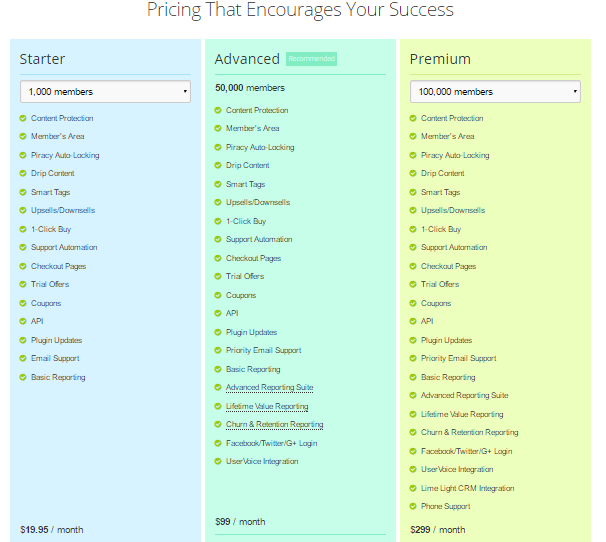 Pricing Approach With over 100k pricing configuration supported, Chargify can handle a high degree of customization. You won't be at a loss for options when structuring your pricing. MoonClerk relies on Stripe to accept both one-time and recurring payments. It's customizable, works for desktop and mobile, has an easy setup, and doesn't require any technical experience. The huge bonus is that they integrate with Stripe, which makes Stripe (whose tagline is “Stripe—Payments for Developers”) accessible to everyone whether or not you have a coding background. MoonClerk advertises that they can get your online business up and running and accepting payments in one day. It's a simple way to collect recurring payments while you work on other aspects of your business that need attention. It's also one of the more affordable options out there, with monthly pricing starting at $15. Though MoonClerk is affordable and makes Stripe easy to set-up, it's missing the same features that Stripe is which means you're likely going to have to use it in combination with other products. How Does This Fit In Your Billing Solution? MoonClerk provides a solid option for quickly setting up your subscription management system, but it will be one tool of many in your kit. 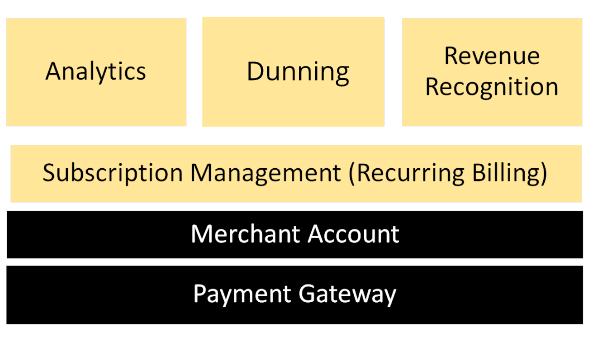 You can use Stripe for the payment gateway and merchant account, but if you want more advanced features for analytics, dunning, or revenue recognition, you'll have to add another product to your stack. 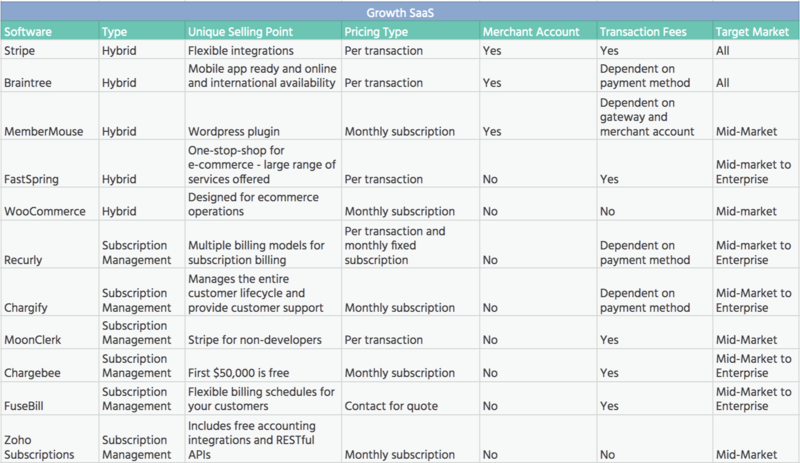 Company Size: MoonClerk is best for startups and small businesses. Their inexpensive pricing makes it easy for startups to afford their product and the product's ease of use and integrations with Stripe means that it's accessible to non-technical team members. Customer Size: MoonClerk's monthly rates based on volume are more suitable if your team has smaller customers with less complex needs. Pricing Approach: MoonClerk allows for flexibility when accepting payments because links to their payment forms can be added to your existing website and emails, or saved as an icon for mobile devices. Chargebee offers one API layer to handle almost all of your SaaS billing needs, including subscriptions, recurring payments, billing, and analytics. It has a lot of options to help you customize your customers' plans. This can be really helpful when you're scaling your business. Chargebee is our pick for companies in the $1M - $20M ARR range with moderately complex pricing. Chargebee allows you to start for free (up to your first $50,000 in revenue), which allows you to see how you'll use the product and which plan is best for you. Customers have also praised the clarity and usefulness of the documentation. They also appreciate the responsiveness of the support team. Chargebee allows you to accept payments in multiple currencies (up to three on one site with the Launch Plan/Basic Plan and more with the Pro Plan). However, you can't manage multiple currencies through a single dashboard, so if you're a global company your analytics will be fragmented and require some extra work. Though Chargebee is a very comprehensive product, you'll still need a payment gateway to directly process payments and a merchant account (for which you could integrate with Stripe). Company Size: Chargebee offers multiple plans that can meet the needs of companies of different sizes. Customer Size: Since Chargebee offers so many customizations and add-ons, the product helps your team accommodate larger customers with more complex needs. Pricing Approach: Chargebee is a great platform to use if your team wants to scale. You can manage your payments as you grow without losing control over data, accounts, or administrative details. FuseBill manages subscription and billing for B2B and B2C companies. It's particularly well suited to SaaS and tech companies, because it offer an API for web app integration. They have flexible pricing options which means your team can offer your customers many different plans and accept a variety of payment methods. FuseBill provides great user experience by allowing you to easily and security collect and transfer data. They have PCI Level 1 certification and 99.95% systems uptime, so you can feel comfortable storing your data there. FuseBill also integrates with Salesforce, which makes it very easy to transfer information to your CRM. Some users have shared that they'd like to see more flexibility in FuseBill's reporting, which doesn't always provide the level of granularity that they'd like to see. FuseBill allows you to manage many aspects of your billing process in one place—in addition to the subscription and billing management system, it also includes analytics, dunning management, and revenue recognition features. Company Size: FuseBill's powerful features, Salesforce integration, and systems security makes it a good tool for larger companies. They target companies with revenue in the $1M to $50M range. Customer Size: The flexibility and range of customizations means your team can support customers of different sizes and with different needs using FuseBill. Pricing Approach: FuseBill is looking to meet your long-term needs as your company scales. By allowing you to offer different types of plans, accept different forms of payment, and use their coupons and discounts module, you can accommodate various types of customers over your company's lifetime. Zoho Subscriptions allows you to automate your subscription management. It allows you to set up a free test account (without a credit card) and only starts charging you when you start billing customers. The sandbox environment lets you experiment with different pricing models so you can determine what works best for you, no strings attached. Zoho Subscriptions has a free integration with their accounting software, Zoho Books. They also offer REST APIs and Webhooks to increase integration options for developers. Though it's great that the product comes with the Zoho Books integration for free, the two products are deeply intertwined, which makes it difficult if you want to use a different accounting software like QuickBooks or Xero. Zoho Subscriptions includes subscription management, instant and real-time analytics, and dunning management. The product integrates with multiple payment gateways. Company Size: Zoho Subscriptions can support large and small companies. Its sandbox environment is great for small companies that are looking to test their options before committing to a particular product and their monthly payment plan means you're never locked into a contract. Customer Size: With Zoho Subscriptions you can bill for individual projects or subscriptions, so you handle different types of customers. Pricing Approach: The REST APIs at Zoho Subscriptions provides another degree of flexibility for developers. Enterprise SaaS companies have entirely different needs for their billing systems than growth stage SaaS companies. These companies often look for feature-rich billing providers that specialize in more than payment processing. Enterprise focused billing and subscription management systems often include other areas of accounting, inventory, and eCommerce control. Choosing the right system for your company is even more difficult for enterprise companies than for growth companies. The complexity requires significant buy-in and training for your team and you may be tied to long-term contracts. These options are expensive, but you get what you pay for. The target buyers for enterprise solutions are companies with high revenue that can afford the top-end options if they provide top-end value. If you've moved beyond the growth stage (congrats!) and need a system that can handle more complex subscription pricing, we're big fans of Zuora. Let's take a look at the rest, once again starting with hybrids - payment gateways with a subscription layer. Digital River is a prime example of an all-in-one solution for an enterprise SaaS billing system. Not only do they offer the ability to process payments, but they also provide a host of other financial solutions. This includes tax and legal compliance for different jurisdictions, risk management and financial reconciliation, and the ability for FX within the product. As one of the more mature systems on the market, Digital River has baked reliability into the product over many years. Though they have different options, Digital River products are still simple to use over a wide-range of use-cases. The software can serve as a single point of contact for the commerce, finance, and marketing teams to coordinate. Digital River doesn't have many customization options for end users. 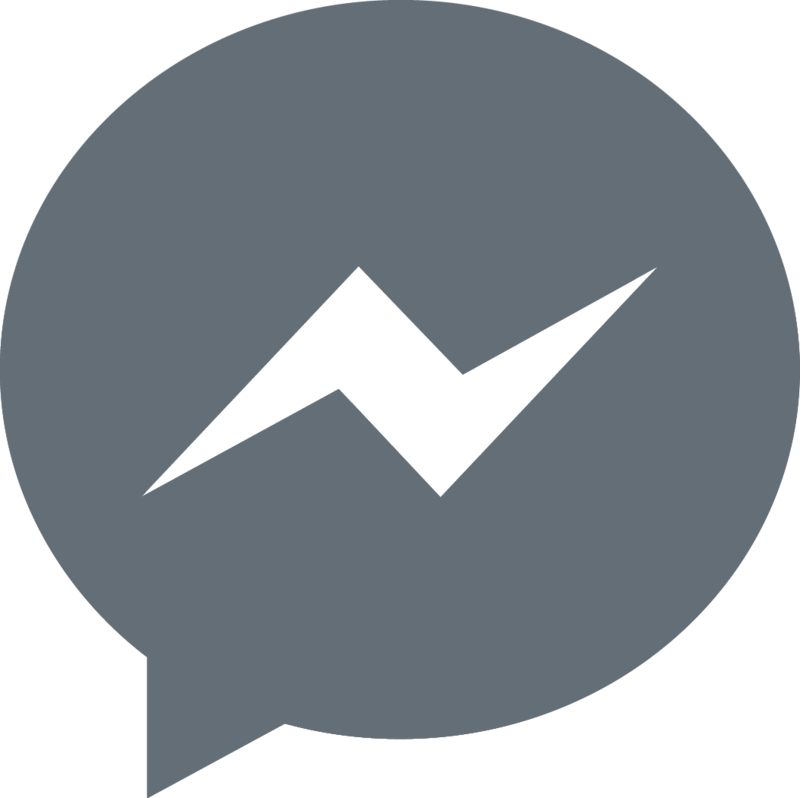 You are largely reliant on the Digital River team for help in a number of situations. Some enterprise companies might be fine with this level of service, but for any that are still looking to move quickly, this could represent a barrier. Though the basics of your billing system will be taken care of, you will still need separate solutions for analytics or revenue recognition if you need that ability. Company size: You should be an enterprise-level company that needs more than just a single turnkey billing system and is looking to integrate your entire customer billing flow into a single platform. Customer size: Your customers are large-scale companies that require enterprise plans and individual contracts. Pricing approach: You should be looking to offer significant customization in each plan you offer to customers. Intacct is an easy-to-use cloud solution that can take the place of an enterprise company's ERP. Financial reporting, contract management, and revenue recognition are all part of the core platform. The intuitive reporting and dashboards make it easy to understand and easy to get up and running for new users. Reporting is Intacct's strong point. Intacct allow you to build easy-to-understand dashboards for different roles in your organization. Your CFO can see balance sheets, expense breakdowns, and cash all in a single screen. Your VP of Sales can see bookings and revenue on a separate dashboard if needed. This allows leaders to get an easy, quick glance into the financial health of the company. Whereas some enterprise level billing systems offer a complete package including supply chain management, Intacct isn't one of them. Therefore, this might not be good for eCommerce companies. However, this lack of insight into manufacturing and inventory isn't a typically problem for software companies. 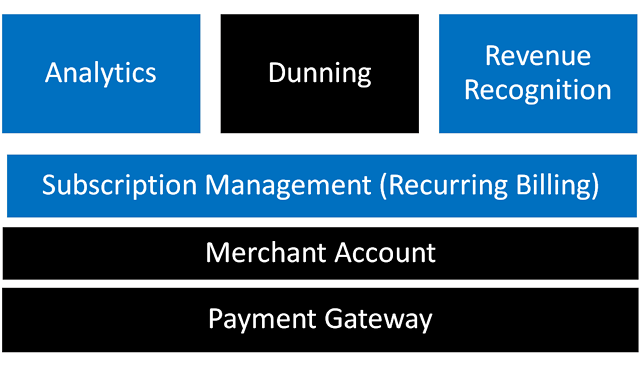 Intacct has dunning and revenue recognition as standard, but doesn't offer merchant accounts or a payment gateway on top of subscription management, so it would need to be paired with a tool that offers these. 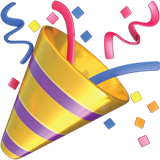 Company Size: Intacct works well for enterprise software companies that have achieved maturity. Customer Size: Though ideal for enterprise customers due to the ability to work with different plans, Intacct can also be used for high-volume, low-revenue customers. Pricing Approach: Intacct isn't as customizable as some other enterprise systems, so it is less useful if you have a particularly complex approach to pricing. Many people know Salesforce as a powerful sales and marketing management tool that helps collect data and conduct analytics. But Salesforce also offers a billing process integration called Salesforce Quote-to-Cash. As a Salesforce Integration it does require having Salesforce as a tool, but it also has access to the rest of Salesforce's powerful platform. By virtue of its connection to Salesforce, Quote-to-Cash has full access to analytics to give you a view into the customer lifecycle. The insight into your customers makes this product stand out. Quotes, proposals, contracts, and billing can all easily be assigned to each customer natively within your CRM without the need for multiple integrations and customizations. The connection to Salesforce is also the main restriction here. As Quote-to-Cash is a Salesforce add-on, it can't be used as a standalone product for companies with different CRMs. It also doesn't offer the same depth of features as other specific billing systems. Though the product works well, it's not Salesforce's core product. 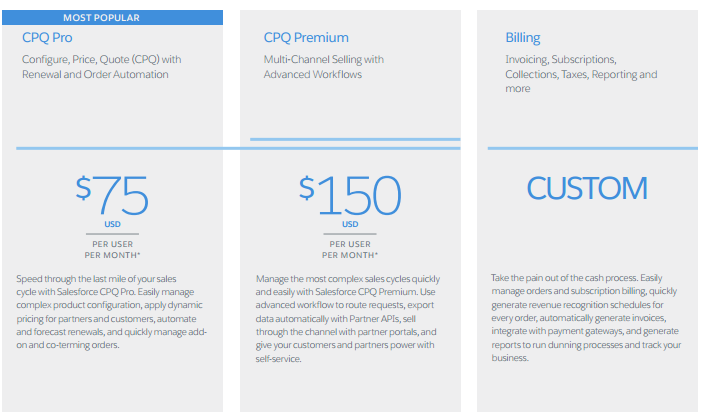 Salesforce Quote-to-Cash is a hybrid service, as it provides both a payment gateway and subscription management. As with Salesforce, you would need to integrate with a merchant account via AppExchange. Company Size: This is a great option for larger companies already using Salesforce to manage their sales and marketing processes. The easy integration with the rest of your Salesforce analytics makes it possible to have all of your data in one place. 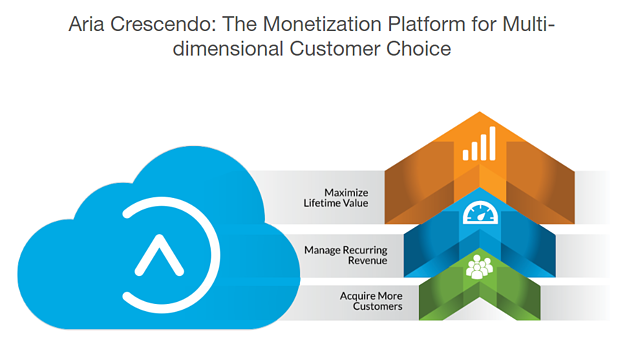 Customer Size: Enterprise customers can afford to pay for customized subscriptions. Solutions will help your sales team find the best package for even the most difficult customer. Pricing Approach: Solutions allow you to offer customized quotes for customers and make pricing adjustments when needed, keeping your pricing flexible. Netsuite from Oracle allows you to manage global transactions in one system. It is a complete system, with a fully-featured accounting suite, a CRM, and features for merchandising companies to manage their supply chain and inventory. The entire package can be easily customized for different companies' requirements. The sheer wealth of data at your disposal within Netsuite is the platform's major selling point. It can give any member of any business unit access to customer information, transaction histories, invoice and order status, and ongoing customer concerns. It allows for a complete overview of the customer and their financial history with the company. 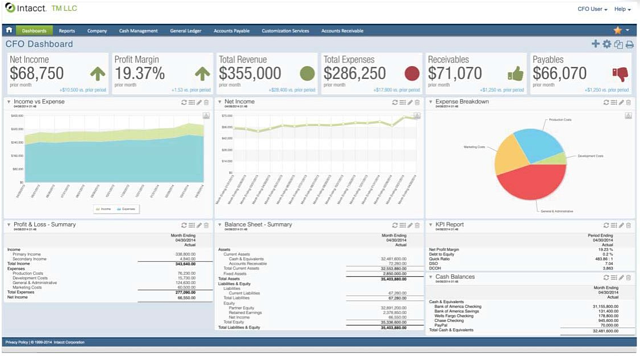 The major drawback for Netsuite is the lack of graphics, charts, and other visualizations that use its underlying data. It's spreadsheet heavy, so new users can have difficulty understanding what all the data means. 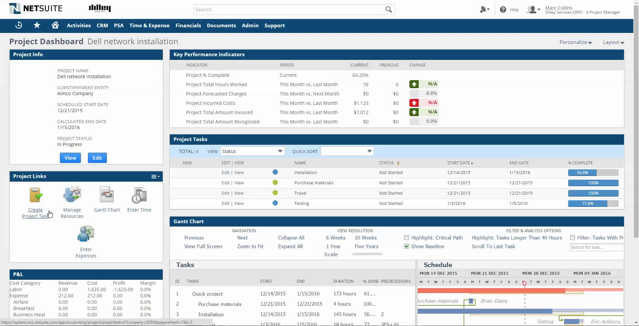 Finance teams that spend their entire day in Netsuite can understand all the data presented. But teams like sales and marketing that just need to quickly check in on certain data points can find the data-driven interface confusing. 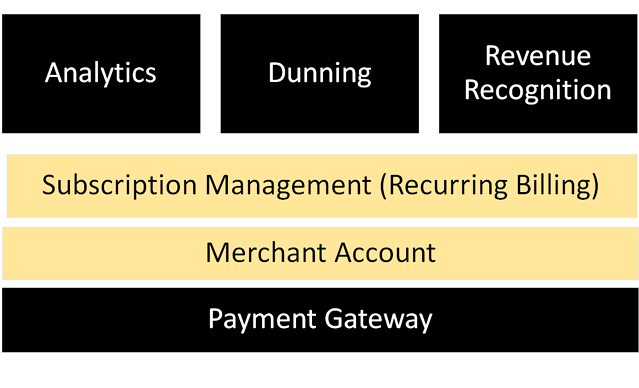 Netsuite checks all the high level for a SaaS billing system—analytics, dunning, GAAP—but it isn't a hybrid billing system with a payment gateway. Company Size: Netsuite is for advanced enterprise companies. Customer Size: It's best suited for companies with higher pricing who serve other enterprise companies. Pricing Approach: Netsuite wins when you need maximum flexibility in your pricing to land extremely large contracts. TRACT is well positioned to service mid-size and large subscription based enterprises, easily accommodating companies with multiple types of billing arrangements. Their enterprise solution boasts the high levels of security, service-level agreements, and “white-glove” customer service that's a pre-requisite to play at this level. TRACT supports for companies with complex usage, time-based, or dynamic pricing. They support 20+ configurable payment gateways out of the box while allowing customers to retain gateway control. They have an adaptable dunning system that allows users to set up event-based rules. Reviews report that TRACT's business analytics tools aren't as fleshed out as some of its enterprise competitors. While their tools may be enough satisfy the needs of some customers, those looking for more developed BA tools may look elsewhere. 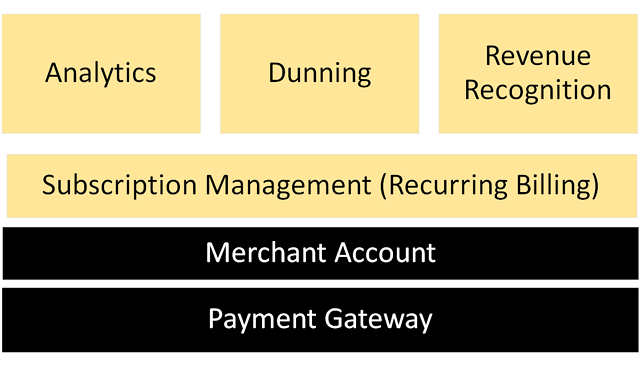 TRACT is a powerful subscription management platform, so you'll need to integrate it with one of their payment gateways to directly process payments. Company Size: TRACT targets the mid-market and Fortune 1000 companies. Customer Size: TRACT can bill everyone from individual customers to organizations. Pricing Approach: TRACT's flexibility allows you to offer a range of pricing options. Like Salesforce, Apttus offer a Quote-to-cash solution for billing. In fact, the Apttus version was originally built on top of Salesforce alone until they chose to expand it out to integrate with other CRMs. This allows you to manage the entire revenue process beyond just billing. You can optimize pricing, upselling opportunities, and revenue recognition from within the platform and follow customers' lifecycles to develop a deeper understanding of each customer. This quote-to-cash structure gives your sales team visibility into the entire lifecycle of a customer. They can access expiring contracts and upsell and cross-sell opportunities to build recurring revenue. Unlike Salesforce, this quote-to-cash platform works across a variety of different CRMs. Again, dunning isn't built in. This critical feature might not be as important in high-touch sales environments such as enterprise, but the lack of dunning basically rules this out for any subscription model based on automation. 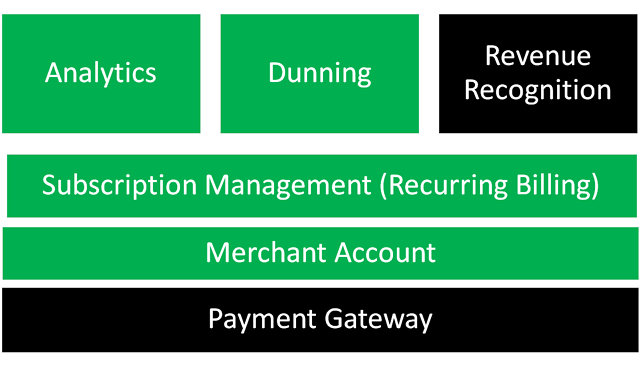 Like Salesforce Quote-to-cash, Apttus requires integration with a merchant account. Unlike Salesforce, it doesn't provide a payment gateway so it will also need to be paired with a payment processor like Stripe or Braintree. Company Size: Apttus is for advanced stage companies where you're producing individual quotes for customers and need to follow their journey through your product to target upselling opportunities at the end of the contract. Customer Size: Large companies that want individual quotes for pricing and have individual needs. Pricing Approach: If you are pricing individually and want to be able to easily track customers beyond the sales process, a quote-to-cash system that fits into your CRM gives you opportunities to gain expansion revenue beyond the initial sale. Now we'll jump into subscription management services designed for enterprise SaaS companies. Aria's strength is its flexibility. It can be used for all types of customers and companies. If you have a simple 3-tier pricing system, it can handle that. It can also handle complex, individual arrangements with different customers. It doesn't matter if your customers are small companies or other enterprises — Aria offers customized solutions for all possibilities. Dunning. 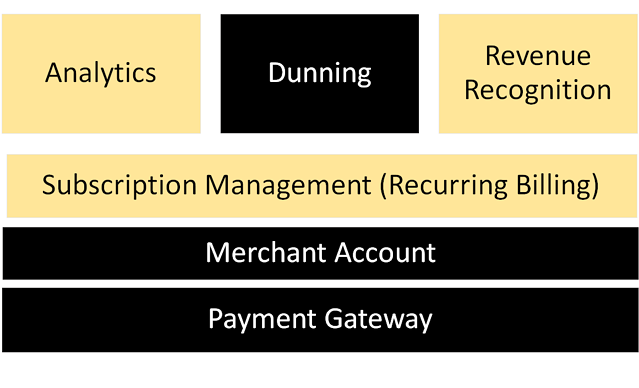 Aria is one of the few enterprise billing systems that includes dunning in their platform. This means that the system can be used to support subscription companies with tens of thousands of customers. Though Aria's dunning options work well for smaller companies, the lack of a free trial isn't. While this is common with heavy duty systems, this makes it more difficult for Aria to appeal to companies looking to try out several billing options before committing. Aria provides the tools needed within a subscription management platform such as analytics and revenue recognition. Company Size: Mid and large enterprises. Customer Size: As they offer significant customization, Aria can handle a variety of customer types and sizes. Pricing Approach: Flexibility means that Aria will work with most pricing approaches. Vindicia looks to get their customers up and running in the shortest time possible. The system supports all subscription lengths, trial periods, freemium models, and usage metering. Vindicia Cashbox allows to test and refine your pricing over time you've calibrated it for your target customers. Vindicia Cashbox's flexibility is its main selling point. It can be configured to meet different needs of different enterprise models. You can customize how customers are billed, what's included in different packages, and how usage is calculated for each billing type. You can also launch campaigns and test pricing with your customer using Vindicia's marketing and sales components. Though Vindicia Cashbox has a large number of features, it lacks dunning and APIs that would allow you to build easily on top of the platform. Integration is vital for SaaS success, so making it more difficult for users and other developers to integrate with your platform means Cashbox might not be the best option for companies that want to do their own customization. 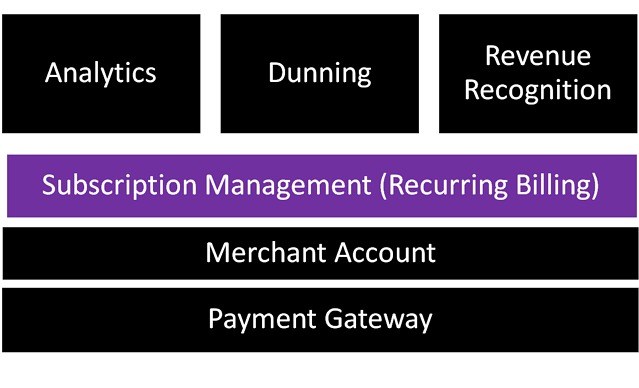 No dunning or revenue recognition options means that Vindicia lacks some features for strong subscription management. However, it can work as a payment gateway, meaning that you only need to tie it to a merchant account before you can use. Company Size: Well beyond the growth phase. Customer Size: The flexibility of Vindicia means you can serve most levels of customers. Pricing Approach: Flexible pricing means you'll need a stack that is equally customizable. Zuora is a cloud-based subscription management system that helps track the entire customer lifecycle. They provide many categories of add-ons that allow you to easily mix-and-match features to design your unique subscription plan. The large range of features means you can easily add or remove options to create new plans and easily generate one-time unique invoices if necessary. Some users report that Zuora has a bit of a learning curve, especially around the reporting interface. 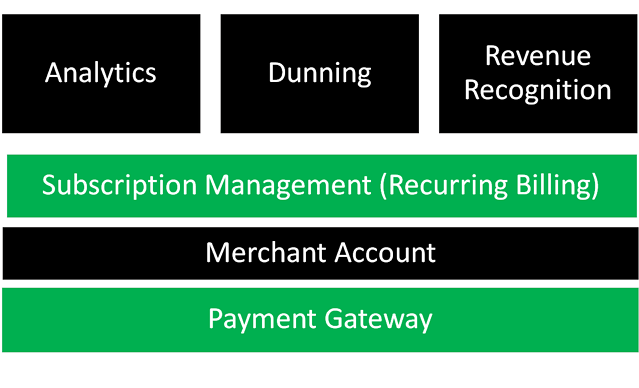 Zuora is classified as a subscription management system because it still needs to be integrated with a payment gateway and merchant account. They support a large number of payment gateways to help round out your billing system. Zuora is our billing system of choice if you're above $20M ARR. Company Size: Zuora is best for large, established companies. Their flexibility and customizability make it possible to address any scenario. Customer Size: Your customers should be larger companies that will likely request more flexible services, but are also willing to pay higher prices for these custom plans. Pricing Approach Zuora's many add-on features allow you to offer customizable pricing plans that can easily be changed and updated when necessary. Cleverbridge is a turnkey solution for billing that aims to put customer success and your monetization strategy at the heart of the billing system. But once you have the platform up and running, you can still customize each aspect of your pricing to fit in with your business goals. Cleverbridge lets you plan your pricing strategy from start to finish within a single platform. In fact, the product is organized around your pricing strategy. This letsyou build out the tactical and technical aspects of your monetization—subscription management, analytics, processing—from there. Enterprise companies need to adhere to GAAP accounting practices, so the lack of revenue recognition within the system might be a turn off for some larger companies. The lack of revenue recognition here means that you might need another tool for that job if you are truly moving upmarket. Company Size: Far enough along that you have a good pricing strategy to build your Cleverbridge pricing around. But not quite at the top level as revenue recognition isn't included. Company Size: Mid-level companies that are still expanding. Pricing Approach: This is an ideal platform for companies that have a pricing strategy already in place and are looking for the best way to implement it quickly. The worst option for companies employing a subscription business model is to code your own system or relying on a patchwork approach. Instead, we highly recommend selecting a strong billing stack that can scale with you. This ensures that you're set up for success and won't need to shift systems down the road. Most importantly, this frees you up to focus on the real needle-movers: improving customer experience, reducing churn, and increasing customer lifetime value.